«Weathergal» connects people and simple weather concepts to make weather really REALLY fun and FREE. Weathergal makes weather fun! Weekly episodes feature interesting, and sometimes silly, aspects of the weather, atmosphere and beyond. On the site you can check your local forecast, and also get a daily forecast text messaged to your cell phone. Design a fun weather-related website featuring weekly video episodes, daily forecast and extra whistles for members. SOLUTION: Artisan Productions went with a comic book style design to create a fun, cheerful atmosphere on the site, which is totally interactive, full of fun widgets, has free membership and plenty of interesting videos. On the site you can check your local forecast, and also get a daily forecast text messaged to your cell phone. 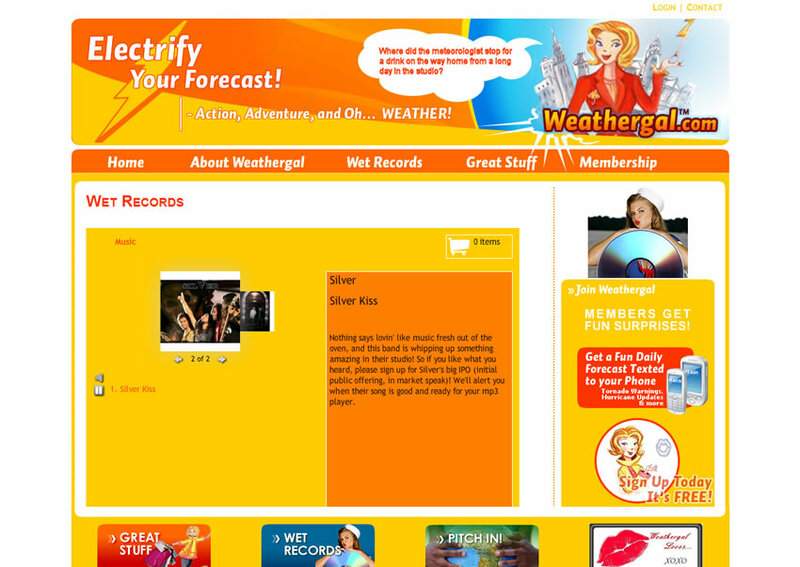 Weathergal is running on our CMS.